Mr. G's musings: Another SAD SIGN of our time. It looks as though THE QUEEN MARY ocean liner will be scrapped. Another SAD SIGN of our time. 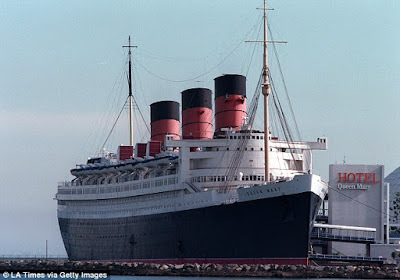 It looks as though THE QUEEN MARY ocean liner will be scrapped. Don't confuse this with the newer cruise ship, the Queen Mary 2. This is the original! I love everything about transportation (both current and past). But this news just breaks my heart. The majestic and loyal ocean liner that transported British royals, celebrities and WW2 war troops is such a magical place. I have stayed there and visited it since the late 80's when I moved from LA to Long Beach. If you are interested in ocean liners and their illustrious past I'd suggest you go and visit the ship soon. I was on that ship once, several years ago. It was a learning experience in that I never knew ships "bowed" downward from stem to stern.